More holidaymakers are booking the ‘luxury’ of a VIP airport lounge despite the woeful economic times hitting the travel industry says TripExtras. The fact that bookers typically get free alcoholic drinks and food when in the lounges means that we’re attracting very savvy travellers. 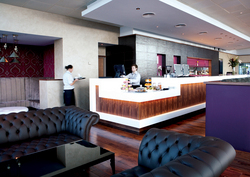 TripExtras, a leading holiday add on’s website, has seen record bookings of their airport lounges with bookings in August 2010 up by over 100% compared to August 2009. TripExtras is owned and operated by Core8 Ltd, part of The Collinson Group.